It is the responsibility of a crime lab scientist to conduct testing on crime-scene-discovered evidence in order to determine the origin of a substance, who was at the crime scene, who may have used weapons at the scene, what an unknown substance (e.g., arsenic in a cup of wine may indicate murder or suicide) is, and what may be deduced from the appearance of a potential crime scene. In essence, it is the responsibility of a crime lab scientist to help law enforcement personnel and prosecutors find out what happened at a potential crime scene in order to determine if anyone needs to be charged with a crime. Fortunately, forensic science today provides many tools with which a crime lab scientist can do his/her job. In fact, forensic science plays a crucially important role in making sure the right culprits are charged with crimes they committed. 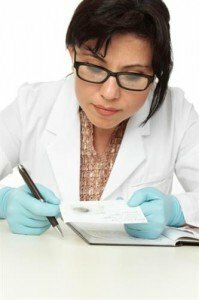 A crime lab scientist can be the culmination of several different occupations within a lab—i.e., forensic lab technician, medical lab technician, etc. As one develops experience within a lab and/or obtains more formal education—more specifically, a master’s or PhD—then the title of crime lab scientist may be achieved. A crime lab scientist is only one of several experts who may take part in criminal investigations. Other related professions include medical examiner (usually a physician), crime lab analyst, crime scene examiner, forensic engineer, etc. A crime lab scientist usually works in labs equipped with very sophisticated equipment and tools, including electron microscopes, gas chromatography, ultraviolet spectrophotometry, infrared spectrophotometry, electrophoresis, variable wavelength forensic light sources, immunoassay, spectrofluorimetry, and others. The work is performed alongside several other types of scientists/technicians. In addition to possibly visiting gory/bloody crime scenes, crime lab scientists may have to travel from place to place (especially if working for a federal agency like the FBI). Although you can enter the profession with merely a certificate or an associate’s degree, this will probably only qualify you for an assistant lab technician position. Obtaining a bachelor of science in one of the life sciences, forensic science or laboratory science, however, will qualify you for higher-responsibility jobs in the field. By all means, find a degree program that is accredited by an organization, such as the AAFS Forensic Science Education Programs Accreditation Commission. According to the US Bureau of Labor Statistics, all those employed within the forensic science field have a bright future ahead of them, especially in regards to such on-going threats as drug abuse, bioterrorism, terrorism in general, substance misuse/abuse, escalating over-all crime figures, etc. As for compensation, forensic lab technicians can make from $32,900 to $82,990 per year. Of course, a crime lab scientist, who usually has extensive experience and graduate degrees, can make more. In addition to this, a crime lab scientist often has supervisory responsibilities and may even be in charge of a whole lab. If you are serious about becoming a crime lab scientist, then the first thing is to do is to obtain a college degree in forensic science or a related field. An associate’s will work but a bachelor’s would be better. After this, find out what tests you will need to take in order to obtain the license/certification most appropriate for your field. The next thing to put in your belt is experience at an approved facility. In time, as you develop your skills, you can achieve the status of crime lab scientist. Of course, you may catapult yourself directly into such a job from college, if you get a graduate degree. Even if that applies, though, few employers give anyone a job without in-the-lab work experience. As such, get into programs that provide valuable internships.